Silver jewelry. Silver candle holders. Silver flatware. LOVE!! 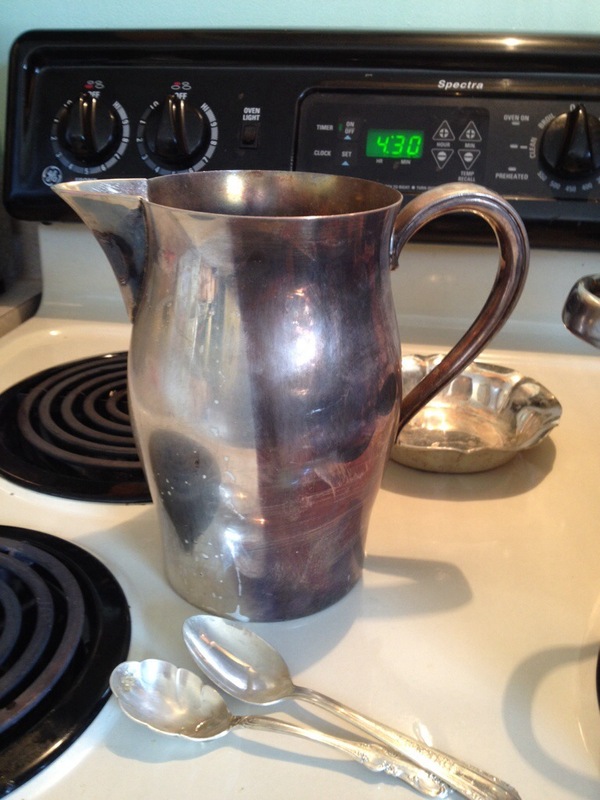 I am always searching Salvation Army, thrift stores, garage sales or freecycle for cheap silver pieces. I use my silver finds for everyday use. Sugar spoons and soap dish holders. It is so beautiful and life is too short to not use it. What I don’t love is cleaning silver. I don’t mind how silver looks tarnished up to a point. Suddenly I will look at my silver and decide it looks too dirty and I will need to clean it. As much as I LOVE silver. I HATE polishing it. Polishing silver is dirty boring work. 😦 and I am kind of lazy. Awhile back I searched the internet for ways of cleaning silver. There are a lot of ways to clean silver. All of them require significant amounts of elbow grease. Yuck. Then I happened on a recipe that seemed too good to be true. It is almost like magic I tell you!! With 3 ingredients and a couple of minutes my silver becomes sparkling and looks new. Wanna see? The spoons and the little dish took about 2 minutes to clean. I put the pitcher half submerged for about 3 minutes before I took it out. Amazing, right? I love it. Shall I tell you the secret recipe? Fill a big pot with water. Put enough aluminum foil to cover the bottom. Add a couple of tablespoons of baking soda. Once boiling, place silver in until sparkly. Take items out with tongs and wash with soap and water. TaDa! Sparkly shiny silver!! Yay. Now before you try this yourself I want to warn you. I only have silver I have paid very little or nothing for. I have never tried this on Great Aunt Elenor’s heirloom pieces. If my stuff gets ruined I won’t be sad. So before you try this on any important pieces talk to your jeweler and make sure it is safe. This entry was posted in DIY, DYI, Family, Home, Life, Thrifty, Uncategorized, Vintage and tagged cleaning, cleaning silver, polish, silver, tarnish, thrifty, vintage. Bookmark the permalink. A girlfriend introduced me to this method and it works well!! Good to “see” you today!